Milk is one of the prime necessities for an infant. Breast milk is best, but not in all cases can new mothers be able to breastfeed. For some of the mothers production of breast milk may be less, while some may not be able to feed their baby due to pre-existing conditions, such as HIV. In such cases, infant formula is provided as a substitute for breast milk. Here we bring you an insight into the Lactogen I infant formula. When we make a comparison between breast milk and Lactogen I, the infant formula looks more nutritious. It is high in calories, protein, total fat, cholesterol, and carbohydrates. Vitamin C is on the higher side in breast milk. Breast milk has many other benefits though. It helps in protecting your baby from a long list of illnesses, as proven by numerous studies from around the world that have shown that stomach viruses, lower respiratory illnesses, ear infections, and meningitis occur less in breastfed babies and are less severe when they do happen. Exclusive breastfeeding (meaning no solid food, formula, or water) for at least six months and this seems to offer the most protection. Various researchers have found a connection between breastfeeding and cognitive development. In a study of more than 17,000 infants followed from birth to 6½ years, researchers concluded from IQ scores and other intelligence tests that prolonged and exclusive breastfeeding significantly improves cognitive development. The American Academy of Pediatrics recommends breastfeeding as a way to help reduce your child's risk of becoming overweight or obese. Infant formula helps in normal physical growth, and for good overall development, breast milk is always preferred. Infant formula should be given at unavoidable circumstances. Many mothers have a doubt if infant formula can be given before six months in combination with breast milk. Exclusive breast feeding for six months is most preferred by most of the health experts and pediatricians. 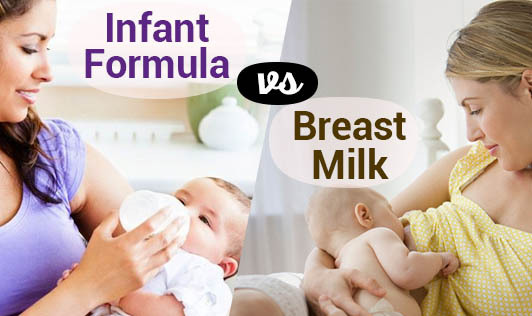 Infant formulas have some minor advantages too such as the convenience of feeding the baby a bottle at any time by anyone, although this is also true for women who pump their breast milk. Also, time and frequency of feedings can be managed as formula is less digestible than breast milk. Formula-fed babies usually need to be fed less often as compared to breastfed babies. Mothers who opt for formula feed don’t have to worry about what they eat or drink- foods that could possibly affect their babies. But there are major disadvantages of formula feeding too. They lack antibodies. None of the antibodies found in breast milk are found in infant formula, which means that the formula doesn't provide the baby with the added protection against infection and illness. Formula can be costly. Powdered formula is the least expensive, followed by concentrated ready-to-feed formulas being the most expensive. Formula-fed babies may have more gas and firmer bowel movements than breastfed babies. For good physical, mental, and emotional growth, breast feeding is the most preferred method. Whatever nutritional option you choose, be sure to talk to your health expert about the choices available to help you make the decision that's best for both you and your baby.